A council has gained national recognition from the Ministry of Defence for its support of the Armed Forces community. Durham County Council is one of only 50 employers including ten local authorities in the UK to receive a Gold Award through the Defence Employer Recognition Scheme this year. The award recognises employers who demonstrate positive attitudes and policies towards serving and ex-members of the Armed Forces. The council was nominated earlier this year for the quality of the work it has carried out since signing the Armed Forces Covenant in 2012 and achieving the Silver Award in 2015. • The introduction of a guaranteed interview scheme for veterans to help those who meet essential criteria overcome barriers to recruitment opportunities. Cllr Lucy Hovvels, MBE, Cabinet member for adult and health services and the council’s Armed Forces champion, said: “I am delighted we have been recognised for our work to support the Armed Forces community. “We are committed to fulfilling our commitments to the Armed Forces Covenant and are proud to be among the businesses, charities and public sector organisations to have won this prestigious award. 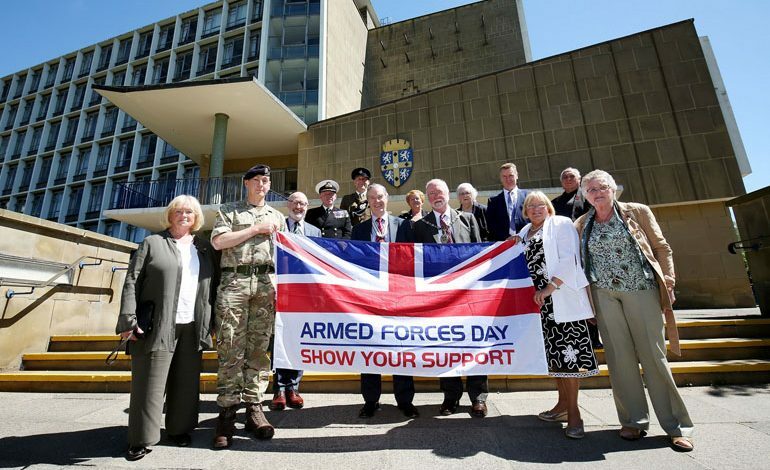 • Pictured above: Cllr Lucy Hovvels MBE (in white jacket), Durham County Council’s armed forces champion, and Cllr John Lethbridge, Chairman of Durham County Council, with representatives from the armed forces flying the official Armed Forces flag on Armed Forces Day.